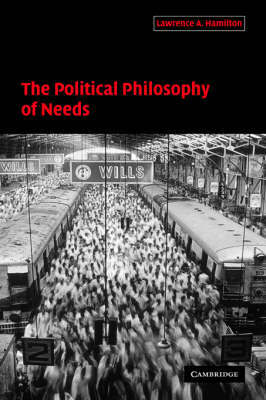 This ambitious and lively book argues for a rehabilitation of the concept of 'human needs' as central to politics and political theory. Contemporary political philosophy has focused on issues of justice and welfare to the exclusion of the important issues of political participation, democratic sovereignty, and the satisfaction of human needs, and this has had a deleterious effect on political practice. Lawrence Hamilton develops a compelling positive conception of human needs: the evaluation of needs must be located within a more general analysis of institutions, but can in turn help to justify forms of coercive authority that are directed toward the transformation of political and social institutions and practices. His argument is animated throughout by provocative and original discussions of topics such as autonomy, recognition, rights, civil society, liberalism and democracy, and will interest a wide range of readers in political and social philosophy, political theory, law, development and policy. Buy The Political Philosophy of Needs by Lawrence A. Hamilton from Australia's Online Independent Bookstore, Boomerang Books. Lawrence Hamilton is Mellon Research Fellow at Clare Hall, Cambridge.